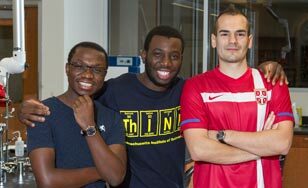 Being from Zimbabwe, Uganda and Serbia respectively, Paul Chazovachii, Isaac Wakiro and Aleksandar Radakovic each have different words they use to describe their friendship. However, there is one thing the three seniors can all agree on. "We're competitive," Chazovachii said. "We're always trying to push each other to be better." Sometimes that manifests in bets about science terminology. Sometimes in arguments about who among them is the most scatterbrained. And sometimes they take it up a notch. "We have a constant argument about who's going to win a Nobel Prize faster," Radakovic said. This past summer the chemistry majors got a taste of what that might be like with scientific research experiences that took them to some of the most prestigious institutions in the world. 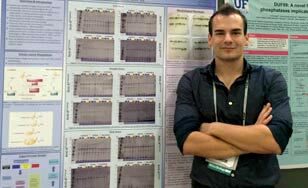 Chazovachii worked on designing degradable polymer — carbon nanotube composite-based chemical sensors — at the Massachusetts Institute of Technology (MIT). 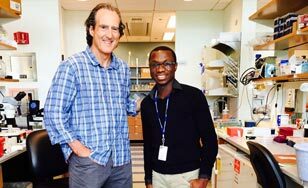 Wakiro researched the identification of cyclin dependent kinase 8 substrates responsible for colorectal cancer development at the University of Massachusetts Medical School. And Radakovic worked to identify novel post-translational chemical modifications on proteins in plants at the University of Minnesota — Twin Cities. In these positions, they met and worked with many renowned scientists in their fields — including a few Nobel laureates. "It was like a job," Wakiro said. "It put me in the mindset to think science, do science, live science. It was really enriching to know what lies ahead and to know that I can perform at that level." The confidence and foundational knowledge each of them has was built right here at The College of St. Scholastica. 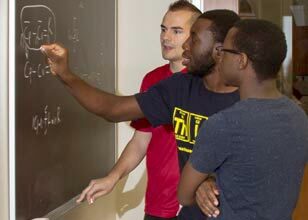 Whether studying anti-malarial drugs, bacteriophages, aging in C. elegans or developing an organic chemistry experiment that is used by the class today, the trio has worked directly beside their professors on valuable, hands-on research at St. Scholastica — and traveled around the country to present it. "We've done research at St. Scholastica every year, which really boosted our chances at getting these off-campus positions and succeeding in them," Wakiro said. "If you're a person who seeks opportunities, this is the best place for you," Chazovachii said. "You really have the opportunity to reinvent yourself here and stand out." These opportunities have positioned the students well for their future goals. 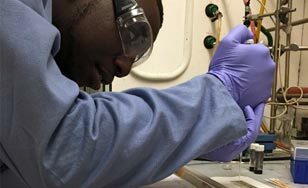 Chazovachii is applying to the top 10 chemistry Ph.D. programs in the country, with the hopes of someday collaborating with other scientists to start summer research programs in Zimbabwe and other developing countries. He strongly believes that this initiative will not only benefit these developing communities but also help advance research and innovation throughout the global science community. Wakiro is applying to M.D./Ph.D. programs to become a researcher and neuro-oncologist (which means an additional 14 years of schooling). Ultimately, he wants to return to Uganda and work to improve the country's healthcare and research systems. Radakovic is applying to many of the same M.D./Ph.D. programs as Wakiro, with the goal of working to develop new, safer cardiovascular procedures, wherever in the world that takes him. No matter where they go in the future, one thing is for sure. "We're going to remain friends," Chazovachii said. "We all agree on that." When you're thousands of miles from home, in the middle of a different culture and climate, adapting to college can be a struggle. "We had all these social and cultural barriers, but people were really helpful at CSS," Wakiro said. "Coming to a small school where almost everyone knows everyone, I felt really cared for and welcomed. I think it was really easy for us to get accustomed to it because of this environment." "It was kind of weird because I felt like I started a whole new life, so I was able to reinvent myself," Radakovic said. "I was able to be whoever I wanted and that was essential to my personal and professional growth."